Last year, when Father was busy finishing the drawings for Freddie's Blanket, there were a lot of conversations at our house about what a platypus would wear. Dresses, shoes, boots, hats, pajamas... what will they wear? We knew they would wear some slippers to keep their feet warm, and Mother immediately thought of the French Press Slippers by Melynda Bernardi. They were the perfect slippers to keep Freddie's mother's feet cozy! Melynda was very kind to allow us permission to reference her slippers throughout the book, and has a beautiful brand new baby of her own, so the timing seemed perfect! Can you see the French Press Slippers here in the finished version of the illustration? 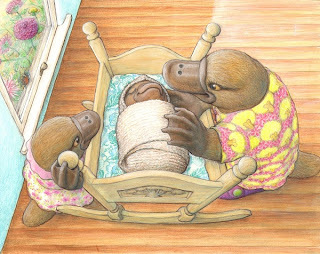 On to the exciting news- one of Melynda's readers will win a signed copy of Freddie's Blanket this week! If you are interested in learning more, you can read all about it here! I was just about to write you to let you know that it was up :) So happy you saw it and excited about the giveaway. Neat! I am really excited about this giveaway, too! (I saw it on facebook this morning.) Thanks for the sweet blog post about us! Just read Melynda's post. What an inspiration you are! So exciting for you! I'm definitely going to buy the books from my LYS. P.S. Love Phoebe's Sweater Video - so cool!